Prolific biographer Charlotte Chandler has written on the life of a different film legend every year for the past 6 years, beginning with It's Only a Movie: Alfred Hitchcock in 2005. Her latest, Marlene, has just been published by Simon & Schuster. Chandler's biographies are based on personal interviews. She includes filmography and career details, but her style is to convey the story of a life in the first-person as much as possible, using the subject's own words. This conversational approach gives the reader a sense of being in the room, listening in, as the story of a remarkable life unfolds. The author's career as a biographer began with Hello, I Must Be Going: Groucho and His Friends in 1978. Written during Marx's lifetime but published not long after his death, it became a bestseller. Chandler returned to the genre years later with her 1995 Fellini biography, I, Fellini. But it was with her first book for Simon & Schuster in 2002, Nobody's Perfect: Billy Wilder, that Charlotte Chandler’s biographies became frequent and consistently titled, each with the annotation "A Personal Biography." In a recent interview with Kirkus Reviews, Chandler was asked how she managed to gain access to so many of the most famous, and often famously difficult, stars of Hollywood’s Golden Age. About Groucho Marx she recalled that someone had given her his phone number, she called and, though Groucho refused to be interviewed, he invited Chandler to dinner. Then, over dinner, Groucho asked why she hadn't been taking notes on their conversation. It was Groucho who later introduced her to Billy Wilder. Henri Langlois, film archivist and founder of the Cinématheque Française, introduced Chandler to Hitchcock, Mary Meerson, also of the Cinématheque Française, introduced her to Dietrich, director George Cukor introduced her to Katharine Hepburn…and Bette Davis, ever the formidable outlier, called Chandler herself, the only one of the author's subjects to do so. Connections abound between Chandler's subjects, most of whom knew and worked with each other, and occasionally one story will overlap into another. For example, Marlene Dietrich and Douglas Fairbanks, Jr. had an affair that lasted for years, and the gentleman had many memories of her. He told Chandler about a series of miniature nudes he sculpted of Marlene and how he eventually decapitated all of them to protect her reputation in the event of his demise. This anecdote is told in detail in the Dietrich biography. It is also woven into the Hitchcock biography, in abridged form, in a section on Stage Fright. I have read and watched much about Marlene Dietrich, from her memoirs (Marlene, 1990), to various biographies, including her daughter Maria's lurid opus, to Josef von Sternberg’s eccentric autobiography (Fun in a Chinese Laundry, 1965), the page on the CIA’s website about Dietrich’s work during World War II and Maximillian Schell’s Oscar-nominated documentary (Marlene, 1984). I have to admit that I had something of a “tell me something I don’t know” attitude before I sat down with Chandler’s book. She did. There are revelations large and small of all kinds...Dietrich's mad plot to kill Hitler, details of her introduction to Ernest Hemingway on the Île de France, the lie she told JFK about his father...Dietrich's memory of her grandmother’s lavender eyes, her habit of giving her hand-me-downs to husband Rudi's mistress...her hatred of knitting because it reminded her of World War I in Germany. Chandler knows how to set a scene and tell a story. 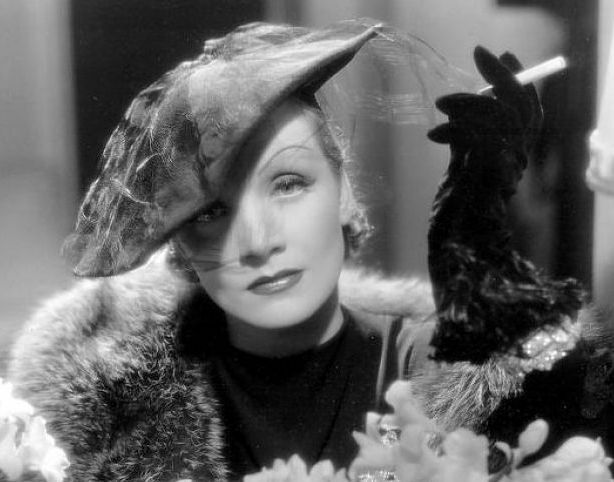 She nimbly leads the reader through Dietrich’s early years, the arc of her career, her personal life and into her late years, when she “closed the door” and retreated inside the rooms of her small apartment across from the Hôtel Plaza Athénée in Paris. Among the many voices heard of those who knew Dietrich at different points in her life and career are her one-time arranger and accompanist, Burt Bacharach and her friend and fellow Paramount star, Mae West. 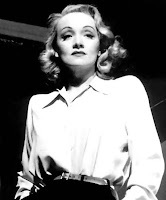 ﻿﻿Maria Riva is Dietrich's only child, and Riva's own sensationalistic 787 page version of her mother's life was published shortly after Dietrich's death. Maria is not a direct source for Chandler's book but her youngest son David, who produced and directed a documentary on Dietrich in 2001, speaks at length. His references to his mother as an "Emmy-winning actress" caught my eye - I'd not heard this before and checked the Emmy website. Maria is listed as having been nominated for a Best Actress Emmy in 1952 and 1953. However, Imogene Coca won in 1952 and Helen Hayes won in 1953. Charlotte Chandler remarked to Kirkus Reviews that Marlene Dietrich had originally been perceived as "another Garbo" very early in her Hollywood career. It happened that Dietrich came to Hollywood as talkies were coming in and MGM was carefully transitioning Garbo, its great star, to sound. When Morocco and The Blue Angel struck box office gold, Paramount saw in Dietrich its opportunity to trump MGM and Garbo. The two actresses were to have distinctly different careers, though both were deemed "box office poison" (along with Katharine Hepburn and others) in the late '30s. However, no one imagined that Dietrich’s film career would outlast Garbo’s (or anyone else's) by several decades or that she would successfully reinvent herself as a high-ticket stage performer. Chandler told Kirkus that though she didn't interview her, she did meet Garbo. Her impression was that Garbo was too bitter about the past to make a good interview. Asked if she thought Dietrich also became bitter, Chandler responded, “not at all. She loved what happened to her," adding that Dietrich hadn’t expected any of it and “she felt she owed her great life to Josef von Sternberg,” her mentor and the director of seven of her most memorable films. I enjoy Charlotte Chandler's uniquely readable biographies. I've read more heavily documented books (the fascinating Barry Paris tome on Louise Brooks comes to mind) and books concerned almost solely with a life on film (David Thomson's excellent "Great Stars" series entry on Bette Davis), but for a pleasurable foray into legendary firsthand memories, Chandler is hard to beat. What a fine review! You've already read and seen many biographical resources regarding Dietrich that I don't know whether my recommendation would interest you, but let me suggest Steven Bach's biography, one of the few works that seriously covers Dietrich's career. Plus, it's been published and reprinted with at least 3 different covers. Great review, well written and with much substance in light of your excellent knowledge of the subject as well as the author. 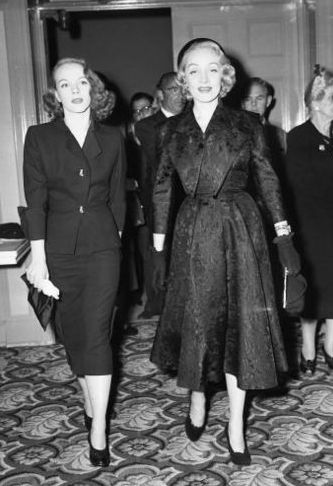 great work/insight/research...a bio of a biographer...tres chic...and DIETRICH...what a life!! Excellent Eve! I have read three of Chandler's books, the fabulous HELLO, I MUST BE GOING, along with IT'S ONLY A MOVIE: ALFRED HITCHCOCK and NOBODY'S PERFECT. Her books read like personal memoirs and are highly readable. I've never read any of her books, but after your write-up I will amend this. The Dietrich book sounds marvelous. Thanks for the heads up. One bit of information I neglected to mention is that a very dear woman and long-distance friend of mine, Leatrice Gilbert Fountain, daughter of silent film star John Gilbert, is one of those Chandler interviewed for this book. Marlene Dietrich was the last love of John Gilbert's short life. Dietrich (who lost her own father as a child), was extremely kind to Leatrice - and especially so after Gilbert died. Leatrice has never forgotten it. Great review! 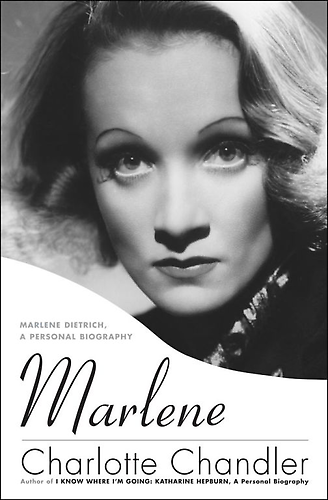 Marlene Dietrich is one of the few actresses who has left me absolutely memorized so I will definitely be reading this book. Eve, thank you for this great review on a Charlotte Chandler biography. I just checked out her biography on Ingrid Bergman from the library, and I'm glad to know I can look forward to a truly entertaining and informative read. Thanks again. Thanks to all for your interest and kind words. Dorian - you MUST blog on your mom's anecdotes about her hour+ chat with Marlene Dietrich (not to be too pushy about it, but now's a good time with the new bio out...). Sorry I'm so late with this, Eve. You know, I was never a Dietrich fan, but I'd love to read this book. What a life Chandler has lived, meeting fascinating people, writing about them. I would really be interested in her books about Groucho, Tennesee Williams, Bette Davis and Mae West! I'll try the library first, but if they don't have them, I'll have to make a trip to Half-Price books and hope I can find some there! Wonderful review of the book -- makes even me want to read about Dietrich! 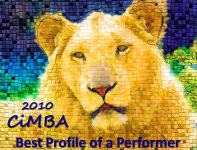 Beautiful and thorough review, Eve! I have two of Chandler's bios, the ones on Ingrid Bergman and Bette Davis, but I haven't had a chance to read them yet. I see Chandler's books everywhere but I have been avoiding picking up any more until I read the two I have. Now I know that there's nothing to be afraid of! Very in-depth review, Eve! The most comprehensive and insightful that I've read on this new biography yet. Because of your excellent review. I can not wait to read the book. If I'm not to late I will run over and enter to win Marlene Dietrich bio. I'm coming late to comment, but I enjoyed your fascinating post. I've read the Donald Spoto bio ("Blue Angel") of Marlene, but I haven't read any of Chandler's - your review makes me want to check her out -thanks!